Bubble Bobble Taito: is an arcade-style action game starring dinosaurs who can run and spit bubbles at enemies. Reptilian beasts of myth are supposed to belch vicious flames from their mouths. Yet with Bubble Bobble, Taito somehow made it completely awesome for dragons to spit bubbles instead. A platform action arcade game that was ported to many home systems, the version released on the Nintendo Entertainment System is available on the Wii's Virtual Console service and shows off just how well its hectic, points-hoarding gameplay has aged. You play as dragons Bub and Bob and set out to the "Cave of Monsters" to rescue your girlfriends. How to do this is simple: Travel through self-contained rooms with platforms and mean critters strewn about, trap each one of these finds in bubbles, and burst said bubbles. Once every enemy in a room has been taken care of, you're transported to the next stage. You've got a large arsenal of power-ups at your disposal: candies that affect how you launch your bubbles; special bubbles that release torrents of water, flames, or thunder; and spell books that unleash screen-clearing magic. Despite the friendly mechanics, Bubble Bobble requires technique to master. You'll have to learn how to "ride" bubbles floating around the rooms in order to reach out-of-the-way platforms and enemies. You also have to take into account each room's "current," which forces bubbles to float about in different patterns at different speeds. 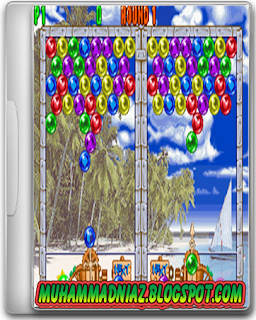 Some of the more difficult stages will force every bubble into a corner at high speeds, popping them after only a short while. Wait too long to clear a room, and a ghastly, invincible White Beluga will chase you until you lose a life or finish the level. But the inviting controls make this all intuitive to pick up, and you'll appreciate the sense of accomplishment that comes with riding a wave of bubbles to snare that last, troublesome twerp hiding in the corner just before the White Beluga catches you. There's also satisfaction to be had when you become more efficient at clearing rooms. Settling for trapping enemies and then popping their bubbles individually is all well and good. However, because you can burst an entire cluster of bubbles at once, the real catharsis comes when you take out every monster in the room at the same time: Just trap each one and then carefully push them all together. The result is a gleeful explosion that sends your enemies flying every which way, leaving behind delicious goodies to grab. Each of these many pickups is worth different numbers of points--putting you that much closer to earning extra lives. The more monsters you knock out at once, the bigger your immediate point reward--and the more you'll litter the playfield with ice cream cones, popsicles, fruits, vegetables, necklaces, baubles, rings, diamonds, crystals, and parasols. In Bubble Bobble's two-player mode, cooperation quickly becomes a hectic competition to see who can grab more loot. The accessible, addictive gameplay makes Bubble Bobble great fun for everyone, though those with an aversion to sweets might balk at Bubble Bobble's sugary presentation. Every character is drawn in an overly colorful, cute, wacky fashion. The music that plays throughout is a single, perpetually chipper ditty that could use some changing up once in a while. Still, the visuals and audio are hard not to love--as is Bubble Bobble as a whole. At 500 Wii points, the 99 completely unique rooms, huge variety of pickups, enemies, and power-ups, and simple yet skillful gameplay make downloading this game a no-brainer. If you have a beating heart, this game is one whose cheeks you'll want to pinch over and over again.